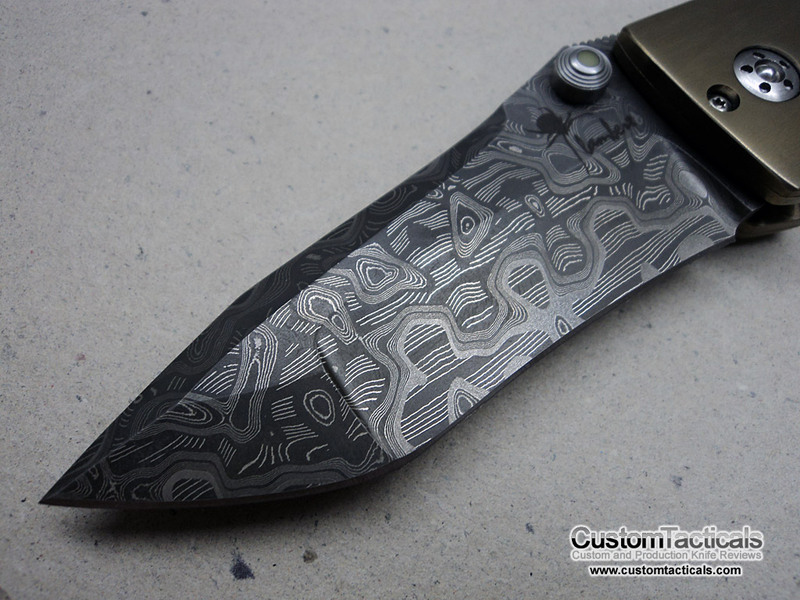 Kirby Lambert’s awesome Custom Orion MGT Damascus.. it seems all I ever talk about is Kirby Lambert when it comes to Custom knives… that’s not entirely true, but he is one of the finest Canadian Knifemakers in the tactical market and (I know I say this every time) this is my favourite piece to come out of his shop. 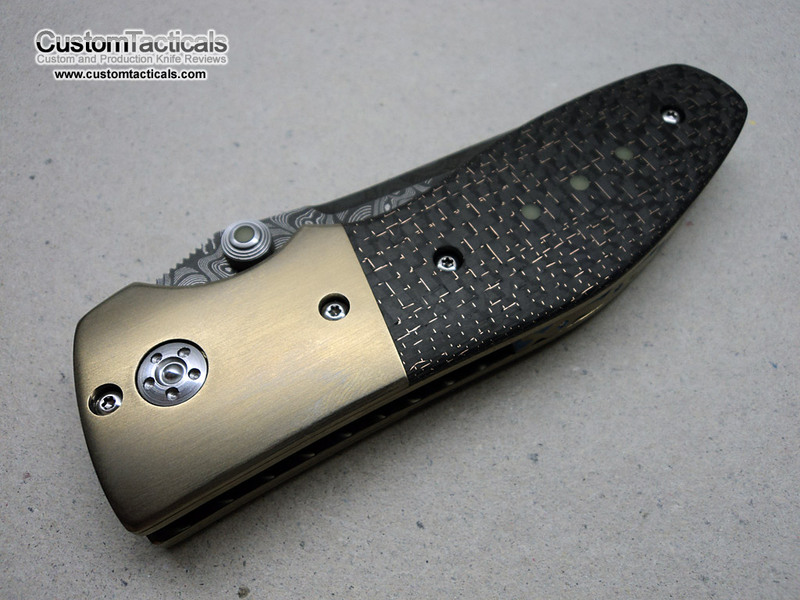 MGT, which stands for Multi Grind Tanto, is a new style of grind that Kirby is putting on his blades. Its an additional option, so costs a bit more for the feature. 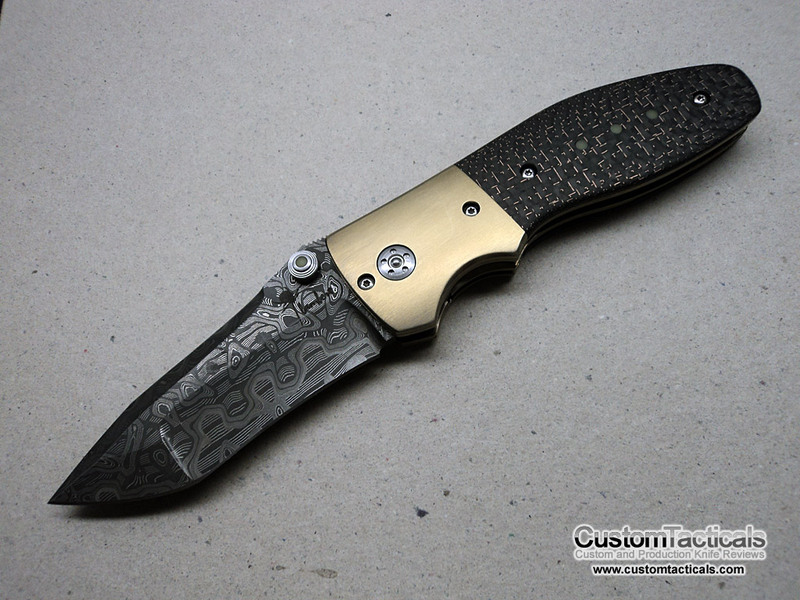 This one here features a Mike Norris Hornet’s Nest Damascus blade and was specially made for me by Kirby. While its not a super-performance steel, its going very good stuff. Mike Norris’ Hornets Nest is composed of 19C27 Swedish Stainless and 302 Stainless, with a D2 steel core, considered by many to be one of the best performing stainless damascus steels on the market. As usual, Kirby has ground this one perfectly. The Orion has a very multi-purpose use handle, featuring one finger choil and a slight hump on the back. 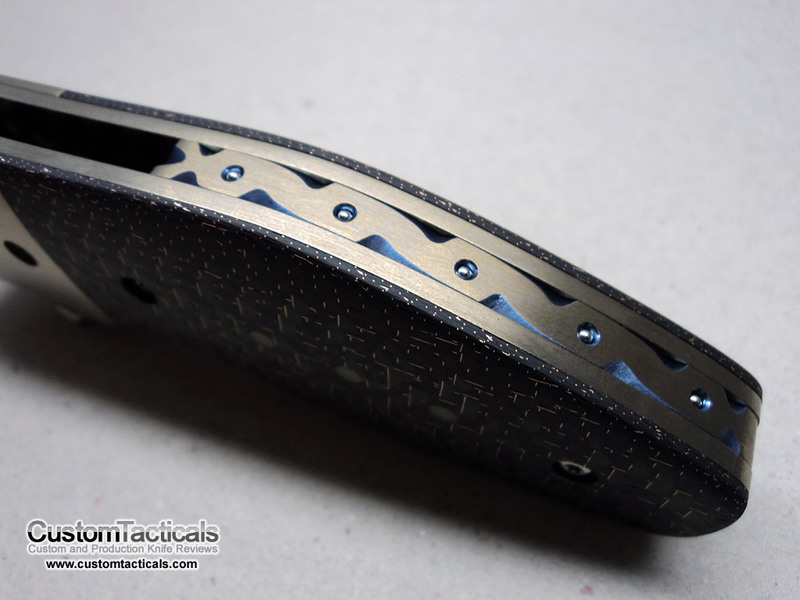 The handle scales are fully contoured and feel great in the hand. The Handle slabs are Lightning Strike Carbon Fiber, which is Carbon Fiber with copper wires run through it. Looks pretty awesome, especially paired with the gold annodized titanium bolsters. 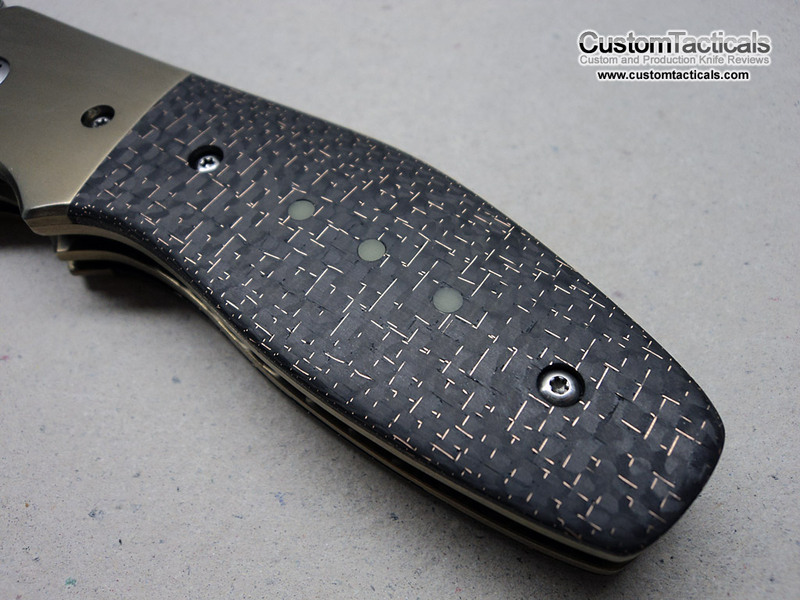 Kirby also inlaid Moonglow dots on the handle, thumbstuds and on the tail end of the fileworked backspacer. The titanium backspacer is inlaid with ball bearings, which is a Lambert signature, and a personal favourite feature of mine. Perfect lockup as usual from Kirby, with annodized titanium spacer and lock bar. The action is flawless with absolutely no blade play in the locked or open positions. The IKBS makes the action smoother and improves the fit, allowing you to flick the knife open if you want. I’m really happy to see IKBS on most of Kirby’s knives now, but even his non-IKBS knives are built beautifully. Kirby has used a special “alien pivot” on this Orion folder at my request. It looks very cool and probably is a bit stronger than a regular pivot screw. It does however use a spanner screwdriver to tighten so may be more difficult to maintain if you’re the type that likes to disassemble his knives. Its no surprise that I love this knife from Kirby. Its an amazing piece of kit, and while it seems impossible, Kirby just seems to keep on improving in little ways that make the end product more impressive. 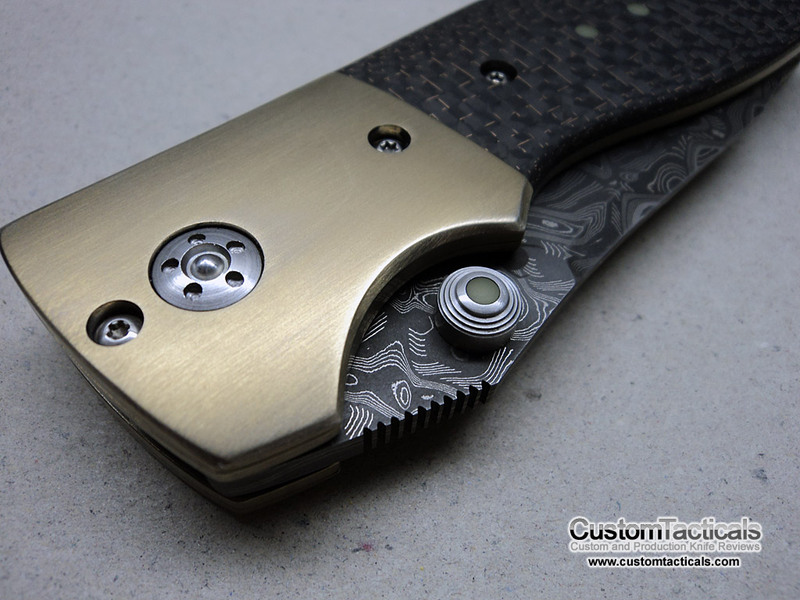 Little features like the moonglow inlays in the thumbstud, alien pivot and multi-grind blade just add a bit more complexity to the knife and an extra level of polish making the final product just a bit more impressive. This is a spectacular knife and I love it! That knife is simply stunning. That multi grind tanto is really cool. and need to know the price and if you can send me to Brazil. Thanks Marcos – but unfortunately this knife is not for sale.. I am keeping it! Please contact me about purchasing a knife or commissioning a similar one. Thank you. IF you’d like to buy a Kirby Lambert custom you’ll have to contact Kirby directly.